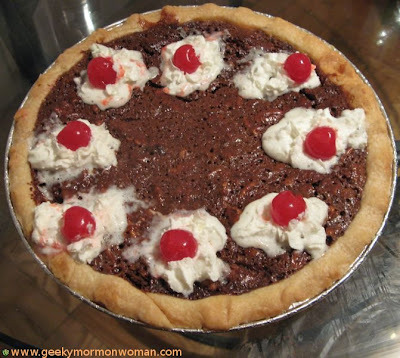 I case you couldn’t tell from my post, I kinda love cool dates.1 So it’s no surprise that I love to celebrate Pi Day. Back in Utah, this was a lot easier, because, my friend Kristine would usually take care of organizing an appropriate gathering for this blessed holiday. But then she got all married and pregnant and had a baby and I moved away,2 so if I wanted a Pi Day party, I was gonna have to do something about it myself. Parties require planning. And Cooking. And Cleaning. I do not make as much time for these things as I should,3 but for Pi Day, I was willing to do it all! I even completely rearranged my living room and put my murphy bed away.4 But the big question was what pies to make? While I had many family pie recipes,5 I wanted a little more "nerd" to my Pi Day than just a selection of pies,6 even if they were really good pies. And then I was struck with a brilliant idea. I had to buy Maraschino Cherries for this. I hate Maraschino Cherries. That’s how much I love Portal. But I was not satisfied with making merely one interpretation of this brilliant joke. No, this joke needed two pies. Or Pies, or Pi’s, or... what is the plural of Pi?14 As you might have noticed before, the phrase could be "The Cake is a Pie" or "The Cake is a Pi". The Pi was made using the directions from the Cake Core, and a bit of quick sculpting with a knife. Does the pie tin also make it a pie? 1 Ok, I’m obsessed with them. 2 It was actually the last one that really was the problem. 3 Messing things up is always more fun than cleaning. 4 Murphy beds are cool. 5 Mostly taken from the 1970s version of The Joy Of Cooking. 6 Yes, I felt the need to nerd up *Pi* day...are you really surprised? 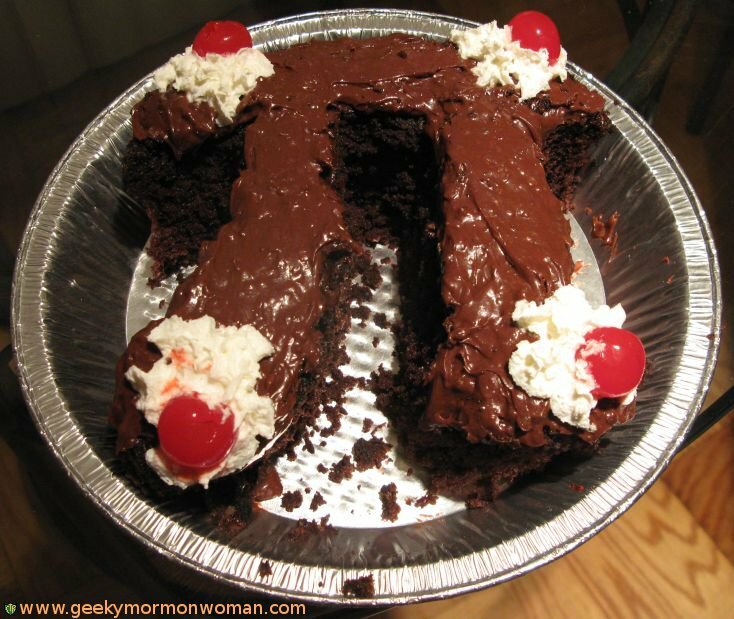 7 Cause you know, the Cake is a lie, but "lie" rhymes with "pie", and so the Cake could be a "pie" or a "pi", instead of a "lie", but that is a lie, cause the cake is really a cake, not Pie, or a Pi. See, I told you the best jokes were the ones you had to explain! 8 As exhibited by previous posts, costumes, videos and furniture. 9 Definition of an awesome pun: Megan thinks that it is cool. Definition of a stupid pun: All other puns that aren’t awesome. 10 At least according to Google. If you search for "the cake is a pie", not all articles on the first page are even related to Portal. But they are mostly at least about cake, or pie. 11 Garnished with fish shaped ethelbenzene. 12 You should make one, they are good. 14 I don’t care that there is only one Pi in the universe, I should be able to pluralize it! English, don’t fail me now!! 15 My guests did tell me they didn’t want to eat the Pi, because it looked like I spent so much time on it, but honestly, it really doesn’t take a lot of time to cut a cake into a pi. 17 And hopefully even think it’s funny! You do think it’s funny, right? 18 Did you get it?? !